If you're making funeral plans—or just attending—you're in the right place. Where do I begin? How can I help the family? Should I send flowers? What should I say to my kids? Death is a subject we choose to ignore until we no longer can. And then, forced to face it, we fumble our way through, overwhelmed by pain or awkwardly giving condolences. Heart2Soul is the resource we all need, but wish we didn't. Where you can learn about funeral traditions and etiquette, so you know what to say and do. 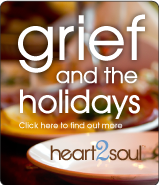 Where you can offer condolences to a family who is grieving. Where you can connect with family and friends near and far during a difficult time. And where you can find resources to help plan a funeral. We've brought together highly-respected experts to provide you with the most comprehensive funeral information on the Web. Our contributors are world-renowned and selected to provide a depth and range of experience in their field. Our goal is to help family and friends find answers at a time when there are so many questions. And to educate everyone as they navigate their way through this difficult life event.